For most people summer starts when school ends and summer ends when school begins. For the Leiser family, it is always summer. We spend every minute of the 8 weeks of camp focusing on the well-being of our campers and exerting all of our energy making sure everyone is having FUN! At the end of each season we immediately begin anticipating and planning for the next terrific summer! Our goal is simple… to enrich children’s lives through the camp experience. Each member of our family is a camp expert in his or her own right. Together, our passion for camp is what sets us apart from the rest! 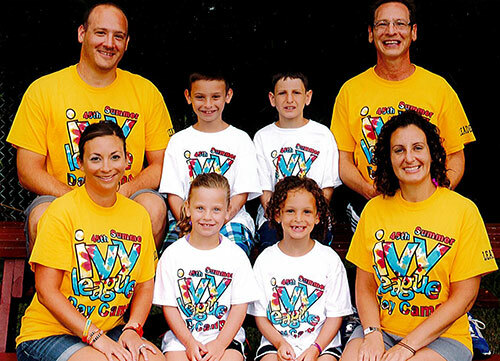 We create a real family feeling at camp – with fun, warmth, encouragement, and learning. Ron and Sandy are former school educators in Health and Physical Education and have vast experience in both day and resident camping. Both hold Masters in Recreation and Camp Administration. 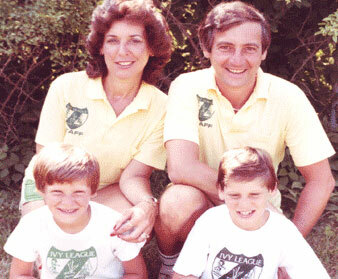 After working at Ivy League Day Camp in the late 70’s, Ron and Sandy purchased the camp in 1981. Jonathan and Evan, who are second generation, grew up at camp. They met their closest friends (and wives!) at Ivy League, made lifetime memories, and discovered their abilities to be leaders as well as how to be accepted as part of a group. So, when it came time to choose a career; camp was a no-brainer! In 1997 Jonathan joined the Ivy League team after graduating from the University of Delaware with a BS in Recreation and Camping Administration. Jonathan also holds a Serve Safe Certification and is a Certified Pool Operator. Evan joined the team in 1999 after completing the Ezersky Camp Safety School and attending Ohio State University. The Ivy League family has expanded to include Jonathan’s and Evan’s wives Alyse and Marissa and their children Jacob and Genna, Sam and Haley. At Ivy League, our family goes beyond The Leiser’s. Ivy League Day Camp has been our “home” for over 35 years and we treat every camper that walks through our front door as “family”. Every summer when kids come to Ivy League, they know that this is their place to learn, grow, make friends, memories and, have BIG LEAGUE FUN! We feel confident and fortunate that our efforts can and do make a difference in the lives of our campers and their families. When you seek a superior summer experience for your child, it is most important to determine that the camp Owners and Directors devote their full time careers and professional interests to progressive camp administration. If that sounds a little serious, remember that at Ivy League the final results of the Leiser family dedication is BIG LEAGUE FUN!! Have your family join our family! We hope to see you soon at Ivy League! THINK SUMMER! !